Penthouse 7 spans over 525sqm and is truly one of a kind with its wide frontage, practical layout and commanding position. Entering the residence direct from the lift, you are met with soaring ceilings, natural light from the floor to ceiling glass and a sense of openness. With multiple zones, this penthouse is perfect for families, downsizers and those looking for more than what is on offer in Teneriffe and Newstead currently. The light travertine floor, is practical yet elegant and ensures a neutral palette suiting everyone is achieved. Similar to a house in the sky, the balcony wraps the whole way around the residence and is a great place for all the enjoy, whether it be the kids or grandkids on their scooters or pets to play. The oversized kitchen is positioned down one side of the residence, with a butler's pantry and plenty of space for your wine close by. Complete with Miele appliances, integrated fridge and freezer, gas cooktop, steamer, coffee machine and oven, this is a kitchen that will delight everyone. Opening direct out onto the balcony, with a built in barbeque, this residence is ideal for indoor and outdoor entertaining. Within proximity to the kitchen is the formal dining, opening out onto the covered balcony with a beautiful rising timber ceiling. Flowing from this is the spacious lounge room, again with floor to ceiling bi-folds, creating the year round Queensland indoor and outdoor living we all love. With an abundance of space, room for a grand piano or your choice of decorations, this generous living area is perfect for even the biggest families to enjoy. Either a fourth bedroom, second living room or complete office is located just near the entry to the residence. Two further bedrooms, both individually ensuited with large robes and direct balcony access are great for children or guests. 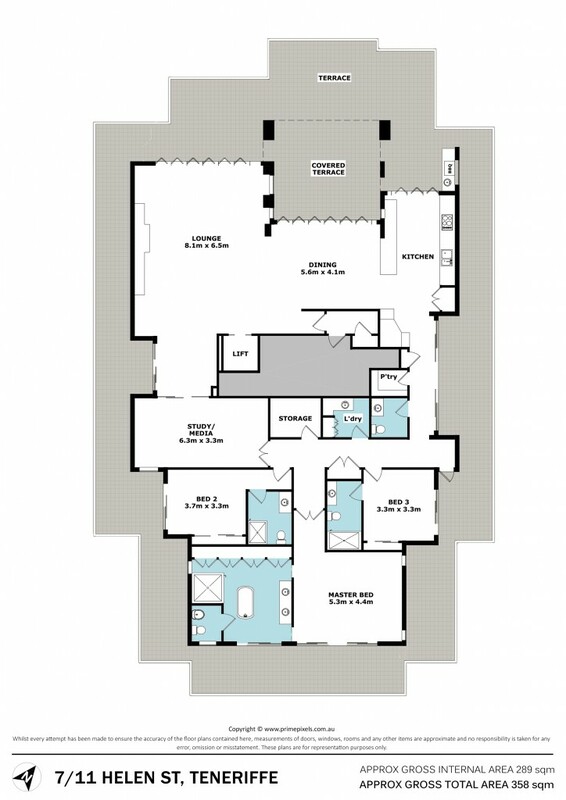 The master suite, with a beautiful void entry, is one of the largest on offer. With direct balcony access flowing through to the open plan ensuite with bath, separate toilet, shower and double basin vanity and robe running for the full length of the bathroom, this is one master suite that cannot be missed. Additional features include CBUS system, intercom, fans in each bedroom, electronic internal blinds in living areas, separate store room in the residence, plus your own store room in the basement over 30sqm in size, private double lock up garage and located in a boutique building of only 7 apartments. Helen Street is one of the well-known streets in Teneriffe, in walking distance to an array of cafes and restaurants, Gasworks, James Street, Teneriffe City Cat and only 5 minutes to the Brisbane CBD. Penthouse 7 will be auctioned on November 8th at 6pm, if not SOLD prior.